Scott has been in private practice for 9 years in the Lakes Region of Central New Hampshire. Prior to opening Infocus Eyecare, Inc in 2005, he taught at Saint Anselm College in the Psychology Department. Over his 7 year tenure at St. Anslem College, Scott primarily focused was Physiological Psychology, Sensation and Perception, and Experimental Design. He conducted several experiments examining how baseball outfielders caught fly-balls, how dogs tracked Frisbees, and how children used their eyes to track words while reading. 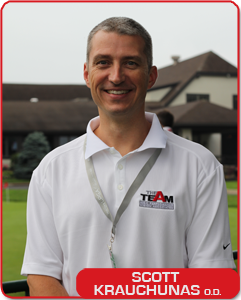 Scott, now brings his talents and passion for sports and the ‘physics’ of playing sports to Athelite Infocus to teach the athlete how to fully utilize the visual system to enhance his/her sports performance.